AllegroMedical.com presents The Bardia Foley Insertion Tray without Catheter. The goal for BARD Home Care Products is to provide urinary incontinence products that best meet the end-user needs. We are recognized by physicians, hospitals and customers for our innovation, integrity, service and quality products. 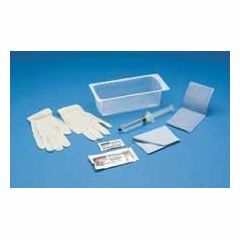 BARDIA Foley Insertion Trays include Foley catheter prepping components only. 3 Povidone iodine or 3 BZK swabsticks. CSR-wrap package or Peel-top package. Easy Storage. Lightweight. Sturdy. Safe. Has everything you need in one package. Everything you need to insert a new catheter except the individual catheter you need. Safe. Easy Storage. Lightweight. Sturdy. by SandyK from Chicago, Il. Works just fine. Lightweight. Sturdy. Works great. Safe. Easy Storage. Elderly. Use it ALL the time. Dear Craig, My daughter is handicapped and up to now has not needed medical supplies. Suddenly, this week, I realized we needed one of your products. I asked for regular shipping, all I could afford - and was overwhelmed when the package arrived by overnight delivery. I want you to know how grateful I am for my first order with you to have gone so well. I had no idea who you were, just chose you as I looked online. Thank you for sending the package so quickly. The product is already being used and is working out well. Thanks again, Leslie. I wanted to thank you for your service. I received my Superfeet inserts in the mail on September 1! I was surprised with how quickly I received the package, thank you! Also, your website was the most affordable option to buy these Superfeet inserts compared to regular stores. I appreciate the speedy service and affordable options on your products. I will most definitely shop with you again!